A "baffled" West Ham boss Sam Allardyce says the decision to disallow an early Alex Song goal was "complete nonsense" as his side lost a second straight Premier League match. The Barcelona loanee had a volley ruled out, after Diafra Sakho was flagged for offside, before the Hammers went on to lose to Arsenal 2-1. "The officials clearly got it horribly wrong," said Allardyce. "Frustrated is an understatement. Baffled is more the feeling." Song's 20-yard volley flew through the legs of Sakho and in to the net early on, only for the Hammers striker to be penalised for offside, before Arsenal went ahead on 41 minutes through a penalty from Santi Cazorla. Danny Welbeck doubled the visitors' lead and, despite Cheikhou Kouyate pulling a goal back after the break, Allardyce was furious at referee Neil Swarbrick's early decision. "They said the attacker was in the eyeline of the goalkeeper," said Allardyce. "Complete nonsense. It is impossible for the assistant referee to say that. They are wrong, Sakho is not in the eyeline of the goalkeeper. "Neil Swarbrick could only guess he might be in front of the goalkeeper. Sakho is running away from goal and lets the ball through his legs - 99 out of 100 are given as a goal this year. I am totally and utterly confused. "If we'd been allowed that goal we wouldn't have lost. We would have kicked on and Arsenal would have found life very difficult from then on." 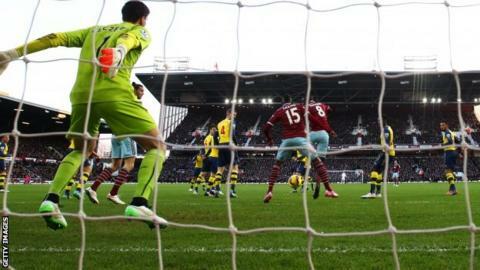 Allardyce also disputed the first-half penalty that enabled Cazorla to open the scoring, after Swarbrick ruled that the Spaniard had been tripped in the box by Winston Reid. When asked if he thought it was a spot-kick, Allardyce said: "No. Reid stuck his leg up and he's gone over on it. I just wish Morgan Amalfitano had done something similar when he got tugged by Nacho Monreal in the last minute. "He stayed on his feet. He was being fouled but didn't go down. There's another scenario for you - simulation is not nice, but when you don't get free-kicks for staying on your feet, you're in a difficult situation." The West Ham boss added: "I've not spoken to the ref because I don't see any point in confronting him when you know you're 100 per cent right and he hasn't had the visuals. You can't get anything out of telling him how wrong he's been." Allardyce's comments came hours after Jose Mourinho's suggestions that the West Ham boss has played a part in a campaign to influence referees' decisions against his Chelsea side. Speaking after the Blues' 1-1 draw with Southampton, during which Mourinho felt his side were denied a clear penalty, the Portuguese made reference to the meeting between his side and West Ham on Boxing Day, after which Allardyce accused Branislav Ivanovic of going down "looking for a penalty".